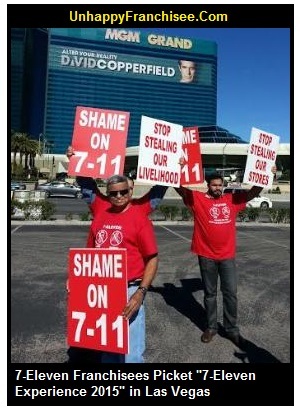 7-Eleven franchise owners protested the company’s “7-Eleven Experience” event at the MGM Grand in Las Vegas, February 10-13, 2015. 7-Eleven, Inc. is engaged in bitter litigation with numerous franchisees and and at least one Franchise Owner’s Association (FOA) over alleged discriminatory practices and unfair franchise terminations. 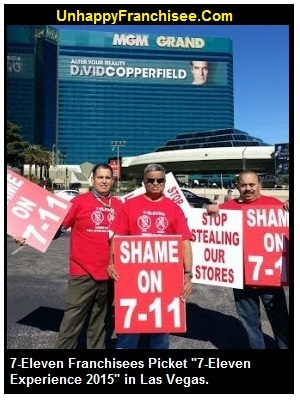 (UnhappyFranchisee.Com) Emotions ran hot as 7-Eleven franchisees and corporate management gathered in Las Vegas. 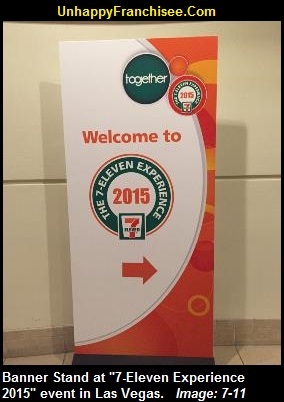 According to 7-Eleven, Inc. CEO Joe DePinto, the 2015 7-Eleven Experience at the MGM Grand is an event where franchisees can provide feedback and share what’s on their minds. Protest supporters are invited to submit protest or meeting photos by emailing them to us at UnhappyFranchisee[at]Gmail.com. Detractors are invited to submit opinions below or by email as to why staging a protest at the 7-Eleven franchisee meeting is inappropriate or counterproductive. This is our chance to recognize and celebrate our Franchisees. It is your chance to attend an event tailored to you. An event where you can provide your feedback and tell us what’s on your mind. In recent months I’ve heard from many Franchisees about important issues that we need to discuss. Joe DePinto stated that there will be “four interactive break-out sessions based on the topics most requested by you franchisees. Noticeably absent from Joe DePinto’s list of topics is the concern raised in a number of recent lawsuits: Whether 7-Eleven, Inc. is discriminating against South Asian franchise owners and illegally seizing great numbers of their stores to resell for profit and/or internal political reasons. Yeah….Joe will be available to discuss everything in Las Vegas, surrounded by his security posse…. Generale DePinto that we’re not happy with the current situation. The “new paradigm” has been turned on its head and we’re concerned and cautiously optimistic but don’t wanna “get fooled again”!! Better to protest when the Japanese board members come and tour US stores with potential investors. Demonstrating around vendors may cost FZ’s their support….just saying….and by the way I am not going to 7EE. Old news Ima….zee’s know that…but the power they have to bring balance and accountability back to the system is to SHUT DOWN FRANCHISING. …SEI doesn’t sell stuff it sells franchises…cut off that gravy train and the beast becomes paralyzed. ….we did that this year….the long range plan is for an IPO to raise capital. …if no one can buy a franchise that plan dies. FZ’s were willing to put their potential goodwill on the line to bring some equality back. SEI can’t run these stores and be profitable. …we do….FC’s don’t have a clue…yes Ima SEI management treats you worse than a FZ….but we make the sales and gp….we just want some consideration for that. This might be Joe’s last 7-11 experience as the mood at MGM is low and moral running all time low. can 7-11 again come back to gain the trust of it’s franchisee’s? 711 Stores have stopped selling. Most of stores are not making money that are for sale by 711. Who will want to buy a store that is 24 hrs and makes two thousand dollars a month if even that? Only a Indian franchisee otherwise close it down as I tell my people. It’s time to shut down ton of 711 stores as you the management have scared away the Indians who would run and maintain your junk. Joe’s name will go down the CEO who broke the well oiled machine. I am part of 711 management and want to find another job where people i can work for a boss who cares (Hint to zone leaders). I am a white female American who has also invested every cent I own into a 7-Eleven Franchise. I also have been screwed by the 7-Eleven Inc. Not only by a MM but also by LP. I don’t think they only use there scare tactics towards the Indian culture I believe that this is there basic business culture. I worked for 7-Eleven Inc for over 26 yrs prior to buying a FZ. I worked my way up from a PT sales Associate to a Business Consultant. I saw so many changes in this company. I would have to say Joe D. is the worse CEO the company has ever incountered. As soon as he took position there was a definet change in the culture of the company. Thats when I decided to purchase a store. BIG MISTAKE!!! All I can say is is they screwed me and I don’t think they are prejudice in who they screw. At least in my area. I have seen Blacks, Whites, Indians, Philippinos taken advantage of by 7 Eleven Inc.
May I ask what part of the country you are in? East Coast? Middle? West Coast? or South? 711 Gals story is so detailed it will be interesting to see if the committee appointments are consistent with what he/she claims. Jerry , if it turns out to be true do you think these board members should resign? to do. Dig through my crap and you may find something interesting. Admin I absolutely believe these “board members” should resign.. I know you state “if it turns out to be true” but no matter the outcome of this, if any, I have no doubt. Been around here too long. I have been away from this site, as a contributor, for awhile now, but have been reading all posts and information in hopes that i would see something great happening to benefit franchisees, but alas I have not. How sad I am to see that there has still been absolutely zero progress in true and unbiased representation of the thousands of 7-Eleven Franchisees who dearly need some help. Several years back I wrote on this very site that the entire existing “National Coalition” structure needs to be trashed and replaced with an ex-Franchisee or Nationally recognized and experienced Franchise attorney who has no reason to cow down to Joe and his Mafioso and would only benefit through precise and determined application of processes which would force SEI and 7&I management into reasonable and fair negotiation toward ending the myriad abuses currently be suffered by 7-Eleven Franchisees. I still believe today that Joe DePinto and SEI are in fact guilty of violating RICO statutes. They are collectively threatening and targeting National vendors for product removal if they do not comply with and support SEI restriction of trade practices. SEI is violating IRS regulations relating to separation of “employee’ and “independent contractor” regulations and Franchisees need to organize and contact their collective Attorney’s General” requesting investigations into those illegal practices. I truly empathize with current franchisee’s plight, but you guys and girls need to quit yelling on deaf ears and start over from square one. In regard to the accusations being put forward by “7-11-Gal”, I challenge you to come forward from behind the anonymous cloak and stand up for what you believe and face the music. If there is substance to your accusations it needs to come to light. I know many of the people being accused and am uncertain that I believe everything I have heard, but would absolutely love to see some proof, because I would be the first to demand their resignations on behalf of current franchisees. As long as “your” representatives give power and credibility to the actions of Joe and his staff by attending ANY of his courts and sessions you have no strength what so ever! With all that I submit to you all: I would gladly accept an independent position as “Chairman” of the National Coalition with a salary which would be based in part on successes in protecting the rights of franchisees and holding all SEI, 7&I and 7-Eleven Japan Board of Directors and management personnel accountable for the past and current violations against franchisees. I would also pledge to cease all glorified “holiday” vacations for executive board members paid for by hard working franchisees who can’t get such “perks”. All monies collected from dues of member franchisees would be put to use defending each and every action brought by SEI against franchisees where proof could be produced that the franchisee was not in intentional violation of the agreement, as SEI is on a daily basis. I would also defend against those abusive “field/business consultants” and “market/zone managers” and undue pressure they exert against honest franchisees, in violation of the franchisees right. How will we get this message out to more? How does anyone who would like to explore this option further contact you. I agree with Workinboy48. We need to protect FZs from SEI’s ruins. If the NCASEF is not working in proper manner, I don’t need any of them. Each store’s owner should stand up and go lawsuit individually. The SEI will try to compromise any lawsuit by compensating the money. That maybe the SEI strategy for now. Therefore if you go lawsuit, you will get the compensation from SEI, otherwise you do not get any money. CaliFZ and any others who may inquire: My name is Dave Hendricks. My e-mail is [redacted: you can request an email exchange with Dave Hendricks by emailing UnhappyFranchisee[at]gmail.com]. I would be willing to meet with any group of Franchisees to discuss ways to defend themselves and promote change within the system. I have been solicited to discuss things I would consider doing to promote (or force) change to benefit Franchisees and i will do that at a later date, but first i will share a few thoughts form those who do not know me. My wife and I were Franchisees in Temecula and Murrieta for over ten years. We were forced from participation in the FOAGLA by members of that organization because of threats and abuses from and propagated by Joe DiPinto, Ena Williams and and Mike Austin. We were then forced to mediate an “exit strategy” from the 7-Eleven system because we were considered “too independent and willing to stand up to SEI, against their abuses and violations of law and the Franchisee Agreement”. During that “mediation” we notified SEI attorneys that the were in direct violation of Federal Statutes and restriction of trade requirements as well as the IRS rules relating to “independent contractors”. At that time they informed us they would no longer discuss SEI issues and only wanted me out of the system. We were NOT defended by anyone on the National Coalition Board, especially the National Chairman, because he was in Joe’s back pocket or up his A _ _ so far that everything he did smelled like Joe’s A _ _ . Also because we were aware that Bruce had made certain assurances to squelch investigations into previous abuses by National Board personnel. All Franchisees were sold out by Bruce! We tried our damnedest to alert and forewarn Franchisees what we saw as the terrible future abuses coming from SEI and 7&I, but it was to no avail. We too were sold out by other Franchisees hoping to get into Joe’s good graces. I ask 711Gal to contact me regarding the accusations she has made against the National board members and provide me with any proof she may have. I believe ALL Franchisees have a right to see such verification, and I will personally fly to California to speak with the National Chairman and his staff if she can provide substantiated evidence. Making false claims only strengthens SEI’s position and division of trust by and in Franchisees. Joe is a tactician and the Japanese business strategies follow battle strategies and they will instill as much mistrust as possible to keep Franchisees from coming together in such numbers as to not be ignored. Franchisees must be willing to fight a battle which stretches the resources and attention of SEI and 7&I and must push so hard that they can not be ignored. State and Federal Representatives and Government agencies are an untapped resource for Franchisees if they can create enough pressure to not be ignored. Accusations substantiated and provided to accountable elected officials is difficult for them to totally ignore. You MUST put so much pressure on SEI that can think of nothing but attorneys and National negative attention. One small protest, no matter how insignificant it may seem, is a great start. Now there needs to be one in each city on “7-Eleven Day”. 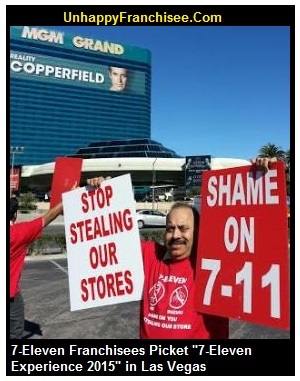 Each and every FOA President should be orchestrating a visual protest across the country in every city where there is a 7-Eleven Franchised Store to bring heightened attention to the abuses. We are considering bringing a National Litigation against Joe, Ena and Mike, all, personally, for violating our rights and interfering with the operation of a recognized trade organization. If Franchisees continue to not give explicit direction to their elected leaders they can NOT expect to be able to hold them accountable! Don’t continue to take a “wait and see” approach. You already took that approach to “wait and see” what SEI was going to do to you, and you took a “wait and see” approach to find out what your elected leaders were going to do to help protect you. What did you get from either of those??? WHAT ARE YOU WILLING TO DO TO PROTECT YOUR FINANCIAL FUTURE AND PROTECT YOURSELF FROM JOE AND HIS HENCHMEN? It is time to consider MAJOR change to the representative structure of the National Coalition. You are paying hundreds of thousands of hard earned dollars to gripe. If you wish to continue throwing away that money, just send it to me and I can do as little to protect your rights as is currently being done. Or you can use it to Hire me to be the National Chairman and I assure you Joe and SEI attorneys will pay attention. They will immediately start calling and threatening current Franchisee leaders and more, but they will definitely start paying attention. Would you rather have someone spend millions of dollars on extravagant meetings and conventions or would you rather that money be spent on changing the system to benefit Franchisees? Would you rather have a National Coalition with Millions in the bank doing nothing, or know that your hard earned money was being used to demand accountability from your Franchisor? Each individual FOA is interested in getting vendor financial support for trade shows and golf tournaments and etc. Would it not be better financially for vendors and Franchisees to hold “regional” shows where vendors could reach more buyers at one time at less cost and get more money for the National coalition to share with each FOA equally based on active membership, as well as more exposure for ALL Franchisee benefit? There needs to be positive change for the benefit of Franchisees and it needs to begin now! Franchisees will NEVER get the kind of support they deserve as long as the National representatives all have something to lose by speaking out against violations and abuses. The system is set up to give ultimate benefit and control to SEI. It is set up to have sufficient “gray” areas to allow SEI to threaten and bully Franchisees who do not have the resources or skill to defend themselves. Why can SEI steal money from Franchisees through accounting practices and get away with millions and Franchisees are threatened with losing all of their life investment for thousands of mistakes which SEI can not prove are the fault of the Franchisee? I also believe it is time to focus more attention to the Japanese. Their names need to be published here and in Japan as abusive management. They will put more pressure on Joe to resolve matters here if they feel embarrassment and shame there, for their abusive practices. Lots to be done guys and gals. I would like to see a comprehensive list of what you as Franchisees would like for your National representatives to work on with some suggested approaches and time lines for reaching some specific goal accomplishment. In the mean time I will be working on a list of what I believe should be started to effect change. i am curious to see how many Franchisees contribute to the list and what they believe is important. Till next time……. I have a slight request of 7-11Gal. Please contact me concerning your assertions of misconduct by members of the board of the National Coalition. I have taken it upon myself to do a bit of fact-finding related to the accusations and I am of the opinion that you do not have all of the facts associated with the events which took place, both before and after the proposed demonstration by 7-Eleven Franchisees, and I believe there is far more to be shared about the meetings and subsequent decisions made by SEI which lead to some of the concessions you describe as “selling out”. If I am wrong, please share the facts and proof with me so I may stand corrected. I also believe that there is a possible communication gap between the National Board and the Franchise community on those circumstances, as well as a division between Franchisee groups as to the best manner in which to bring Joe and his cadre to a reasonable position which strongly favors the entire Franchisee community. I might suggest you make every effort to contact the National Chairman and his staff to acquire more details before making actual accusations. As vocal as I am, I have been able to find nothing which would support such dramatic accusations as a wholesale sell out of the National leadership. Now, I still am of the opinion that there needs to be change in the National organization and the way it functions, and still believe that an ex-Franchisee or Franchisee Attorney would lead to a far stronger representative position for Franchisees. Even the appearance of a conflict of interest or “sell-out” by other Franchisees does great injustice to the Franchisee community as a whole and only empowers the position of SEI management. I’m still also curious what changes you Franchisees would recommend and support and how you would go about implementing those changes. This is why we do nothing. With all due respect, we don’t know who’s gonna flip flop next. I’m out. Admin please remove me and my comments if at all possible. Thanks. Dave…..the NC needs to get rid of the “weighted vote” which concentrates power into a few associations. Smaller, sometimes very effective FOA’s have no real power. Many pat chairman, my self included, used it to their advantage. WorkinBoy48: Nobody doubts that facts are in short supply. Perhaps you can share what you’ve learned and where you’ve learned it. As CaliFZ’s reaction indicates, no one is going to accept vague assurances over the very specific allegations made by 7Eleven Girl without some specifics. 1) We were told in the weeks leading up to the protest that it was going to be a large scale protest with participation and endorsement of the Board. The day of the protest those who sent pictures were very upset that many of the key members had pulled out at the last minute. This seems consistent with 7Eleven Gal’s account. 2) We received and published a submitted account of the protest which said board members were involved with the planning of the protest. GC Eric Karp wrote us a threatening letter claiming the Board wasn’t involved in the planning or notification of SEI about the upcoming protest. Eric Karp’s strangely urgent and confrontational letter seems consistent with 7Eleven Gal’s account. 3) We received a second extremely detailed account of California & Texas meetings that seemed (if true) to contradict Eric Karp’s assertions that Board members were not involved with planning the protest or notifying SEI. This second account seems consistent with 7Eleven Gal’s version of events. For some reason, Eric Karp would not respond and defend the assertions in his letter to UF. 4) Neither GC Eric Karp nor any of the Executives or Board members have responded to our requests for a rebuttal or denial of 7Eleven Gal’s allegations. Why is that? 5) Several things 7Eleven Gal cited as part of the deals seem to have come to pass, including Joe DePinto attending the meeting in Destin, the appointment of the board members to the CEO’s Roundtable, the withdrawal of support for the protest, Eric Karp’s letter. He/she seems pretty informed. What did your investigation reveal about these occurrences? Coincidence? WorkinBoy48, it’s not realistic to expect that a person who has taken pains to maintain anonymity is going to contact you when you’ve already communicated that you doubt his/her story without offering any specifics as to why you doubt her account, and what alternative scenario you discovered. Please feel free to share what led you to your conclusions. 7-11 (at least in much of PA Southern NJ and other areas where Sheetz and Wawa operate) are getting outclassed and out-sold and frankly out-cleaned. WAWA, unlike most 7-11s, are immaculate and sell fresh made for you food. I never go to 7-11 except as a last resort. As WAWA goes national, which I surely hope they do, 7-11 is doomed without major changes in decor, food offering, cleanliness, and attitude and demeanor of staff. None of 7-11 troubles are surprising. in opening in new 7eleven warehouse and all new opening in Omaha neb. do want the opening new help jobs soon in Omaha neb.